Facing east for a moment of daydreaming, my eye is drawn to my favorite tree. Three seasons of the year she and her neighbors are uniformly robed in leaves, but in winter she is revealed. The curve in her spine and a raggedy squirrel’s nest tucked behind one ear do not deter her. She is dancing. This entry was posted in photos, When Time Stops and tagged dancing, photo, tree on December 4, 2012 by lynnettedobberpuhl. Cat-tabulous is out of control. This is the conversation we’ve been having. 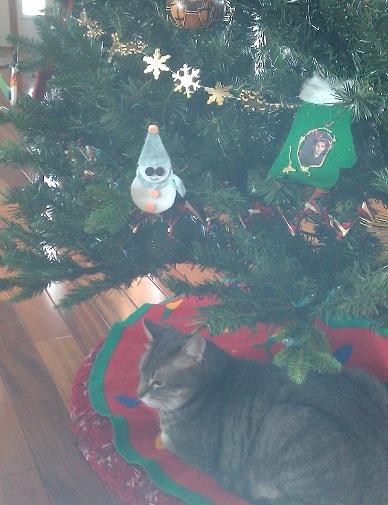 Cat: I LOVE this Christmas tree! Attacking the tree skirt is the greatest! Me: What are you doing in there? Stop that! Cat: heeheehee You can’t see me, but as soon as you leave the room I am going to ram that base so hard the whole tree will jingle! Merry Christmas! Me: Bad kitty! What is wrong with you? Me: *walking into the room* Hey! That’s my tea! Cat: What? You were still drinking this? It’s getting pretty cold you know. Would it kill you to make me a cup, too? Have you thought about going herbal? You seem stressed. Cat: You are throwing something into the recycling bin? I want to go out into the garage. Me: Stay back, cat. You walk all over the vehicles, and you don’t like the garage anyway. Cat: No, I really, really do! I LOVE the garage! I want to go out. Cat: You are going out to the garage? I want to go out to the garage. Me: I’m just getting towels out of the dryer. Stop trying to trip me! Cat: I want to go out to the garage. Cat: You are going out to the garage? I want to go out to the garage!! Me: *Throws garbage bag into can* FINE! Go out to the garage. Cat: Yay! I am in the garage and very happy, you should have let me out here hours ago. I could spend my life out here. Cat: *picking at the weather stripping with his claws* It’s booooring out here! Let me in! Me: Stop that! Get in here, you turkey. Cat: I don’t know why you get upset when all I am doing is enjoying these beautiful cat toys you hung at my eye level. BTW, this felt snowman? Tastes like chicken. Me: No! I love the snowman! Cat: I wonder what the felt mitten with the photo of your son in first grade tastes like? Cat: Why are you still wurrrrking? It is time for everyone to go to bed. Here, I am going to walk across you and nudge you with my slimy nose (don’t ask) and stomp on you with extra pointy feet until you give up and come to bed. It is in everyone’s best interest. Me: Ow! Stop that! *Sigh* You are right, it’s late and I’m tired. Sleep will do us good. Let’s go cuddle. Cat: Yay! You’re in bed! Listen, it’s dark and you can’t see me so well, so I am going to announce every move I make with that charming purr/meow noise you like. Prrow! I am standing next to you. Prrow! I am laying down by your side. Prrow! I don’t like this spot, maybe down by your ankles. Prrow! This is pretty good. Prrow! OMG, I forgot to bathe! I shall do so now, noisily. Prrow? Why are you so cranky? I’ll just move then. Prrow! See, I moved over here! *Silence* Prrow! Now I’m walking casually across the bed. I thought I’d find a spot to lay down, but I didn’t. Weird. I think I’ll just jump onto the floor instead. Listen to how loudly I can land! *Silence* Prrow!!HaulingAssAllTheWayAcrossTheBedNow-BetYouDidn’tSeeThatComing! Prrow? Sheeesh! What is your problem? I was just getting ready to get some shut-eye and you are all grabby and tense. Where are we going? The basement? You are so unreasonable. Hey, you know what the basement needs? A Christmas tree. This entry was posted in Cat, Humor and tagged cat, Christmas, frustration, tea, tree on December 12, 2011 by lynnettedobberpuhl. Christmas Tree day started off with the High School Band fundraising pancake breakfast at the VFW, which, I am sorry to say, nobody wanted to go to. It is a fine event and supporting the youth and community is SO important, but as a family, we don’t tolerate potlucks and community meals well. I was dragging the family along when a donation would have made more sense because imposing awkward social experiences on reluctant children is a hobby of mine. To top it off, Mr. Wordtabulous had developed a “stomach ache” and couldn’t come with us. I just bet he has a stomach ache, I thought as I watched volunteers sweep by with carafes of coffee and trays of orange juice in little plastic cups. I felt guilty for not volunteering, which added to my social wrongfootedness as I greeted the band moms I know, but who intimidate me. There is a metaphoric mask I wear on these occasions, much like the mask you might remember from the cartoon The Jetsons, the one Jane Jetson wore on her early morning video phone chats to hide the fact that she hadn’t done her hair or makeup yet. My mask is supposed to hide the fact that I am not relaxed or comfortable and that I suspect the person I am speaking with thinks I am an utter doofus. In the cartoon, the woman with whom Jane video-chats sneezes and her mask flies off to reveal that she isn’t made up for the day either. I didn’t sneeze, but I could feel the mask cracking a little around the edges, and I think the other women saw it, too. The music, the people, the place: what was probably cheerful and energetic for most of the other people there knocked me a little more off kilter. I hadn’t quite slipped off the shoulder of the road into the ‘bad day ditch,’ but I could feel things inching in that direction. Leaving the VFW, with the strains of “Soul Man” escorting us on our way, I could have cut my losses. A reasonable woman would have said, “this is not your day to get a tree, honey; go home and read a book or take a nap.” But I had decided that Dec. 4th was Tree Day, and stubborn adherence to what has been decided, especially when it makes no sense at all, is an inherited insanity which I was not strong enough to overcome. Mr. W. was still claiming sick tummy, so it was up to me and the boys. 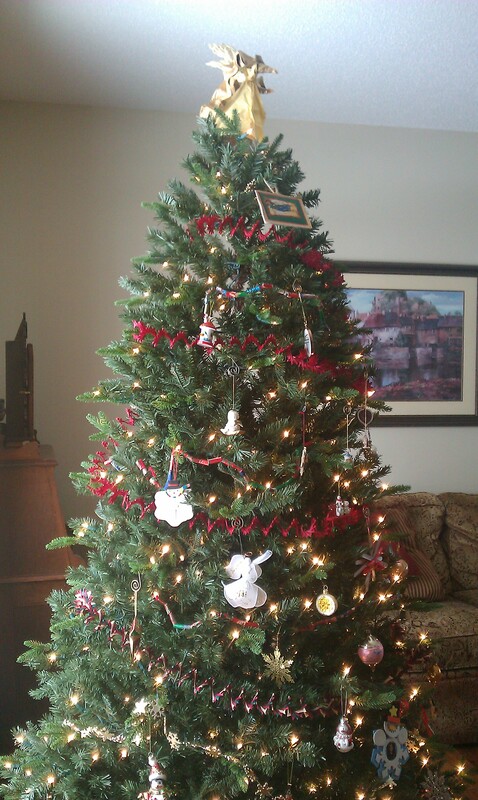 We had decided to go back to an artificial tree after many years of Boy Scout tree sales and cut your own experiences. Still discombobulated from breakfast, we went to Menards’ Enchanted Forest, which I propose they rename Menards’ Enchanted Forest of the Damned. I like Menards, except for the fact that I can never find anything, including employees to help me find things. Enchanted Forest is basically an artificial tree lot, big enough to be found easily even in Menards. 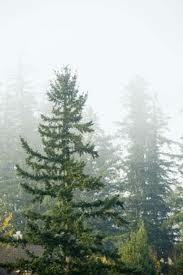 It had a pretty good variety of sizes and types of trees, which was where the decision became complicated. Pre-lit or standard? The boys voted pre-lit, openly voicing a preference to NEVER having to help me deck the tree with lights again. I don’t think it is unreasonable to try to space lights evenly, but evidently I am something of a Captain Bligh about it. 7 foot, which would fit nicely in the front room, or 9 foot, which would be lovely in the vaulted family room? Flocked or unflocked? Short or long needles? Hinged vs. hooked branches? I was feeling rushed, overwhelmed and burdened by my self-imposed need to make a decision without having done any research. Also, and here is the thing that was driving me right over the edge, there was a boombox nestled in the center of the trees, playing zippy synthesized Christmas carols at a nerve-scraping volume. That was bad enough, but in the background, you could still hear the more orchestral Christmas carols playing over the store’s sound system. The combination was unspeakable. After checking and re-checking the tree options I had to exit the Enchanted Forest to calm my auditory system and catch my breath. The boys were completely unphased by the noise, but nonplussed by my wild-eyed reaction to it. We had narrowed the choices down to two, but still needed to find out if the trees were available, which meant going back in and systematically checking fifty or so tags until the right boxes were found. I suggested that I might sneak into the copse of artificial trees, within which the demonic boombox was still spewing tin-can melodies and turn the thing off. Younger son looked down at me and calmly informed that if I did so, I would have to figure out where in the store was the furthest point away from Enchanted Forest and look for him there. I was lectured about the inadvisability of “turning off other people’s appliances,” and no rebuttal was allowed. My whole argument for bringing the boys along was that I wanted their advice and needed them to carry the tree for me (I can totally carry the tree, but was angling for some family teamwork.) Mutiny. Fine. I took a deep breath and we dove back into the Enchanted Forest. After some frantic sticker surfing, I gave up looking for option two and the boys grabbed the only one of our choices we could find, the 7 foot pre-lit Norfolk pine with hinged branches. Good-bye, Enchanted Forest. Of the Damned. Forever. Home again, the boys disappeared upstairs into their respective digital worlds where I could hear them laughing, (and was that singing?) while I examined the four pieces that, assembled, would be our decorative Christmas masterpiece for years to come. Twenty minutes later I was in a fetal position on the floor reconsidering my enslavement to traditional cultural practices. Also being very self-pitying. The next try went better. I figured out that I had started with the wrong piece, which had made the whole thing unstable. Now it was stable, but heavy and pinchy on the fingers, and increasingly irritating. I grumpily assembled and decorated that tree in the meanest Christmas spirit since Scrooge. By MY MARTYRED SELF. I picked out the most meaningful ornaments for everyone in my unfeeling, unhelpful family. And…it is beautiful. False start aside, it took half the time to decorate because of the pre-installed lights, and there were no dead strands to deal with. It fits the space perfectly. I had to devise a prosthetic branch to brace my angel tree topper, which I ingeniously did out of a pencil and some sticky wax (a win!) Then I took a nap. Reset. My horrible children were wonderful again, and my faker husband really did turn out to have a stomach ache which lasted well into the next day, but he still managed to tell me what a good tree we picked and how nice it looks. After 45 years of hopping back and forth from the dark side to the bright, you’d think I would have learned more about how illusory and temporary these lapses are. In some alternate universe I am serene and confidently living my life with gracious good sense through good times and bad. In this one it appears I am a more of a cautionary tale about the hazards of unrealistic expectations and forgetting the point of Christmas: love and giving as exemplified by the life of Jesus. If this, or any other season is getting you down, I highly recommend prayerful meditation on the true value of all the activity in your life. Since I didn’t do that, I can also suggest hanging in there and doing the best you can until you can get a nap, but try to get the prayerful meditation in too. Support the community, spend time with the people you love, revel a little, and give to the less fortunate. Also, back away from the ‘best Christmas ever’ ideal and remember you are loved even when you are imperfect. You are in good company. This entry was posted in Humor, Persistence, Popular Culture, Religion, Uncategorized and tagged bad day, Christmas, family, Jane Jetson, Menards, tree, VFW pancake breakfast on December 5, 2011 by lynnettedobberpuhl.